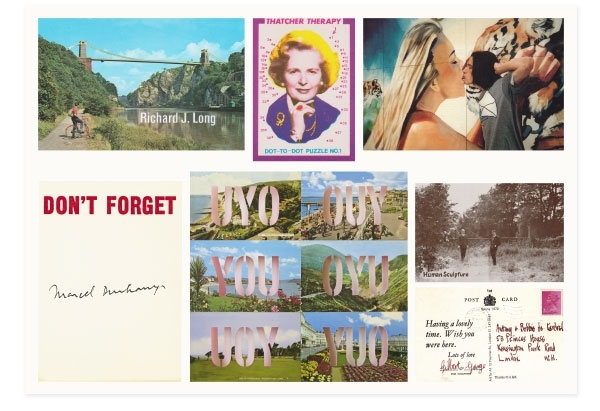 Selected from Jeremy Cooper's major artists' postcards collection, Wish you were here? presents works by some of today's most famous artists. The familiar postcard phrase 'Wish You Were Here', appropriated by several artists in the exhibition can be traced back to the early 20th century tourist postcard. It may be less straight-forward than it appears, gathering to itself a host of complex longings, dreams and regrets. People spend many years longing to be somewhere else, feeling that things would somehow be better if only they lived elsewhere or were someone else, as expressed in some of the postcards with titles including: Wish You Were Her, I Wish I Were You, Wish I was There and always wanting to be somewhere else. The exhibition however goes beyond the cliché of its title and looks at the remarkable diversity in which artists have considered the postcard as a medium in its own right, through which we can trace important moments in the history of Modern and Contemporary art from the 1960s to the present day. Manipulated, collaged or originally produced, artists' postcards express an idea, aesthetic and intellectual, most of them postable, even when made out of wood, bone or stone. Whether creating fictions, social comments or visual humour, they are fascinating and exquisite small works of art in their own right. Curated by Jeremy Cooper in collaboration with Cynthia Morrison-Bell. Produced and toured by Art Circuit Touring Exhibitions. 23 October 2015 - 28 February 2016.